Four persons – two males and two females, were killed on Friday in an accident when a truck running on top speed pushed a commercial bus off the Kara Bridge on Lagos – Ibadan expressway into a river beneath it. The accident which occurred around 10:50am involved a Sino truck marked KMC 47 ZB and an Urvan bus. Two of the passengers in the bus died at the scene. 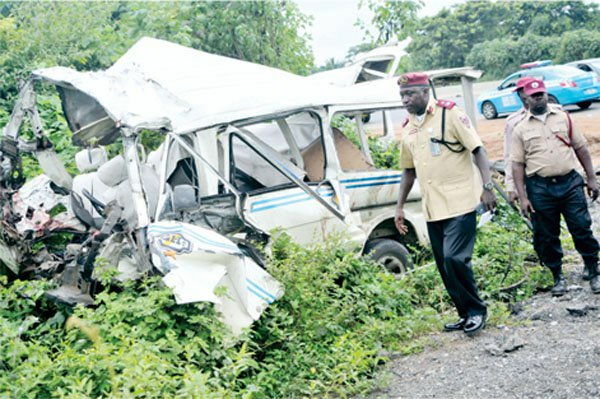 The spokesman of Ogun State Traffic Compliance and Enforcement Agency (TRACE), Mr Babatunde Akinbiyi who confirmed the auto accident, said the remains of the dead were kept at the morgue of the Olabisi Onabanjo University Teaching Hospital, (OOUTH), Sagamu, while the injured are receiving treatment at the Lagos State Emergency Centre. According to Akinbiyi, the truck driver and his boy have also been arrested and detained at the Akute Divisional Police Headquarters, Akute, Ogun State. “Out of the six occupants in the commercial bus, four died on the spot and their bodies have been deposited at the morgue of Olabisi Onabanjo University Teaching Hospital, (OOUTH), Sagamu, while the injured are receiving treatment at the Lagos State Emergency Centre. “However, the two occupants in the truck (the driver motor-boy) have been arrested and detained at the Adigboluja Police Station, Akute along with the accident truck and commercial bus,” Akinbiyi added.